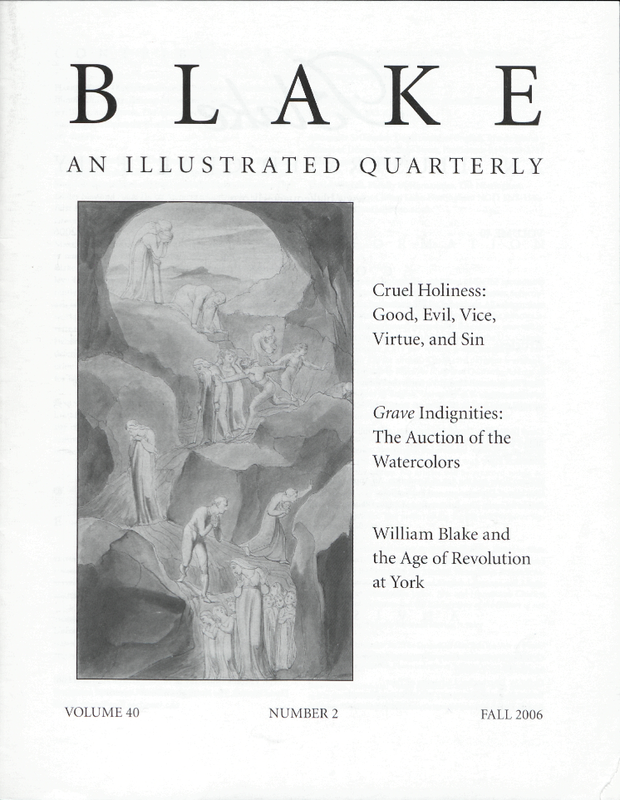 Elizabeth B. Bentley has worked on Blake with her husband in libraries around the world; she specializes in research on long-lost (sometimes still lost) works by Blake, including The Ladies New and Polite Pocket Memorandum-Book (1782), The First Book of Urizen (E), “The Ancient Britons,” and Blake’s Grave watercolors. Mark Crosby (mark.crosby@university-college.oxford.ac.uk) is researching a DPhil at Oxford on the three year period Blake spent in Felpham under the patronage of William Hayley. Troy Patenaude (masterpiece16@hotmail.com) is currently finishing up his PhD at the University of Calgary in art, social transformation, and cross-cultural learning, while working as a guide and educator in that field at his wilderness retreat in the Canadian Rocky Mountains. Angus Whitehead (whitehead65_99@yahoo.co.uk) has recently completed and defended his thesis on the later years of William and Catherine Blake and is currently a researcher based at the Centre for Eighteenth Century Studies, University of York. Eugenie R. Freed (eugenief@netactive.co.za) is a research fellow associated with the Department of English at the University of the Witwatersrand, Johannesburg, South Africa. Currently, she has both Blake and Milton on her mind (amongst other things). Front cover: Watercolor for “The Descent of Man into the Vale of Death” (framing lines cropped here), later engraved by Schiavonetti, bought in (i.e., unsold) at $480,000. Photo courtesy of Sotheby’s New York. See page 66. Back cover: “Friendship,” known previous to 2001 only in the reference to it in the first 1805 prospectus, bought for $270,000 by a private collector. Photo courtesy of Sotheby’s New York.